Missed Cut: Jim Carter (77-72-MC), Franklin Langham (77-72-MC), Kevin Sutherland (76-73-MC), Brian Watts (74-75-MC), Billy Andrade (76-74-MC), John Daly (78-72-MC), Chris DiMarco (75-75-MC), Brian Henninger (75-75-MC), Craig Spence (78-72-MC), Fuzzy Zoeller (75-75-MC), Robert Allenby (78-73-MC), Matt Gogel (76-75-MC), Jeff Maggert (76-75-MC), Joey Sindelar (76-75-MC), Scott Gump (79-73-MC), Jerry Smith (76-76-MC), Kevin Wentworth (78-74-MC), Graeme Storm (81-72-MC), Darren Fichardt (82-73-MC), Rory Sabbatini (83-73-MC), Aaron Baddeley (82-75-MC), Kazuhiko Hosokawa (83-76-MC), David Sutherland (84-75-MC), Hunter Haas (75-85-MC), Greg Norman (70-71-76-WD). Weather: Ideal weather on Thursday and Friday with mostly sunny conditions and afternoon temperatures reaching the mid to high 70s. Windy on thursday, but relatively calm Friday and Saturday. Saturday’s weather was overcast with periods of light to moderate rain in the early morning hours. Play was suspended on Sunday at 11:15 a.m. due to heavy rain and thunderstorms that remained in the area for the majority of the day. At 4:15 p.m. the fourth round was officially suspended until 8:30 a.m. Monday morning. conditions on Monday were ovecast and cold with temperatures ranging from the high-50s to the mid-60s and winds reaching 10 mph. The 2000 Memorial Tournament was Jack's year. He had built Muirfield Village Golf Club decades ago and gave it the Memorial Tournament. Now, here he was, 60 years old and in the midst of a season in which he planned to play the four major championships in succession one last time. Given that, and the fact the tournament was being played for the 25th time, the Captains Club that selects the honoree each year had long ago decided this would be Nicklaus' year. As Nicklaus spoke his heart to the enormous crowd that gathered around the 18th on that beautiful, sunny day in late May, Tiger Woods was getting ready. The 24 year-old phenom, who had been mauling the competition on the PGA TOUR for the last two years, entered a new phase of his professional career May 30, 2000 at Muirfield Village Golf club. Instead of just winning tournament titles, he was now defending them. Woods joined Nicklaus, Hale Irwin, Greg Norman, and Tom Watson as two-time winners of the Memorial Tournament. He also became the first to win the tournament in consecutive years. Woods shot a 2-under-par 70 in the rain delayed final round and defeated Ernie Els and Justin Leonard by five strokes to make the Memorial his first successful title defense. 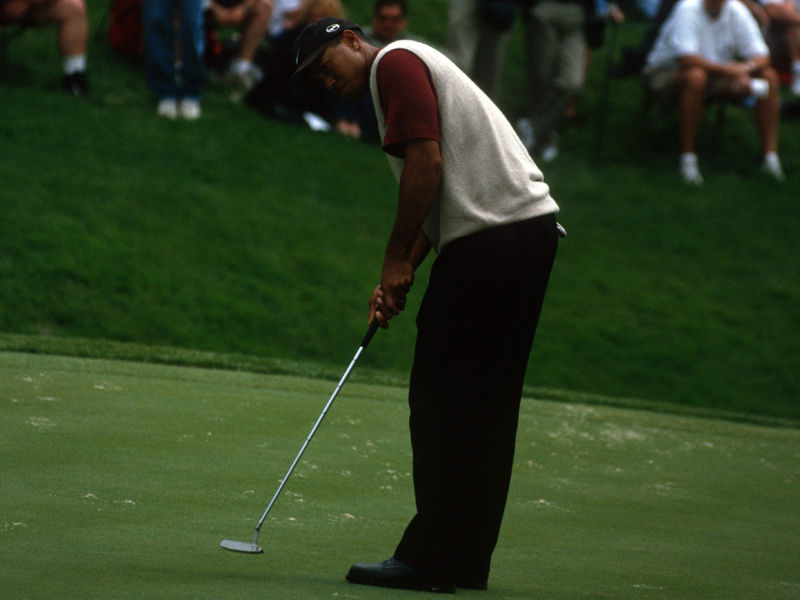 In 1999, Woods had to scramble time and again out of the greenside rough, but this was not the case in 2000. He hit nearly 78 percent of the greens while finding 82 percent on the fairways. He built a six-stroke lead after three rounds by bogeying only one of his first 53 holes. He finished 72 with only four, two of them on the last six holes, when the issue had long since been decided. A damp spring in Dublin had spawned the thickest rough in memory, and gusting wind put it into play. Eighteen golfers broke par, the fewest in 10 years. The field of 105 averaged 74.35 strokes, the most in 10 years. Texan born Harrison Frazar, who grew up playing in the wind in Abilene, avoided a bogey in a six-under-par 66 that staked him to a three-stroke lead over Kenny Perry and Tom Scherrer. It was the largest first-round margin in six years. "I guessed well. Educated guesses," said Frazar. Frazar missed only one fairway and three greens, birdied six holes and saved par out of the only two greenside bunkers he was in. Leonard, not too far behind his old college roommate at 70, said it was the only kind of golf that would do on such a day. Frazar was in the clubhouse, having increased his lead to five with a 69, when Tiger teed off Friday. Twenty-three putts and 63 total strokes later, Woods was 10-under par and leading Frazar by one. Els, at seven under, was the only other player on the leader board standing lower than minus five. Woods, who birdied four consecutive holes on the front side and five of the last seven, equaled the second best score in the tournament's history. With a late starting time, he saw good scores going up in docile conditions, and, when he checked the pin sheet, he saw many accessible flags. Finally, he was advised on an ominous weather forecast that would make the chances of playing Saturday doubtful and a 54-hole tournament possible. "It was a good day to go out there and just post a good number because we don't know how many holes this tournament is going to be, 54 or 72," Woods said. Tournament officials were already taking precautions for Saturday before play finished Friday. Because more than an inch of rain was forecast overnight and into the next day, they grouped the cut-down field in threesomes and had everyone off and running by 10:30 a.m. It was all for naught. Mother Nature hit the Memorial with another duck hook as barely one-tenth of an inch of rain fell all day. The round was done by 3:15 p.m., and the outcome was all but decided. Hitting 12 fairways off the tee and permitted to improve his lie in each of them (the TOUR imposed the "lift, clean and place" rule in anticipation of heavy rain). Woods followed his 63 with a 65 that gave him a six-stroke lead heading into the final round. Woods had played his last 22 holes 15-under par. His 128 for the middle two rounds was three-strokes better than the tournament's previous low for back-to back rounds. His 17-under-par 199 was one stroke off the 54-hole benchmark set by Scott Hoch in 1987. Woods' closest challengers entering the third round were unable to keep pace. Frazar and Els shot 78 and 72 respectively. Steve Lowery assumed the honor of escorting Woods during the final round. A 66 left him in second place at 11-under 205, a stroke in front of Justin Leonard, who also shot a 66. As it happened, Lowery and Woods were still two and a half hours from their tee time on Sunday when the fourth round was suspended at 11:15 a.m. Play never resumed and the round was called for the day at 4:15 p.m. What had been forecast for Friday night and Saturday, finally opted for Sunday. Almost two inches fell to ensure that the 25th Memorial Tournament would not finish until Monday for the third time in tournament history. On a dry, but cool Monday, Woods broke neither 70 nor Lehman's 72-hole scoring record of 20-under par. Neither mattered to him though. "I knew the record was 20 under, but it was not my driving force today," Woods said. "Going out on the front nine, I tried to go ahead and shoot basically three, four, five under and try to blow this thing wide open so that on the back nine the guys knew the tournament was already over. I shot three under, but Ernie kept making birdies." So Woods finished with a 70 for 269, missing Lehman's record by one. Els, after faltering in the third round with a 72, rallied with a 65 to share second place with Leonard at 274. Leonard shot 68; Lowery 73 and a tie for fifth.